ATLANTA, Ga. (November 7, 2018) – Oldcastle Infrastructure is pleased to report that the BioPod Biofilter System with StormMix™ Media has been reviewed and approved by the Virginia Department of Environmental Quality. The BioPod is approved and listed on the Virginia BMP Clearinghouse with a 50% total phosphorus removal efficiency, the highest available rating. The approval was secured based on our field data set from the state of Washington, and the General Use Level Designation (GULD) received there. BioPod systems utilize an advanced biofiltration design for filtration, sorption and biological uptake to remove Total Suspended Solids (TSS), dissolved metals, nutrients, gross solids, trash and debris as well as petroleum hydrocarbons from stormwater runoff. BioPod systems use StormMix media, an engineered high-flow rate media to remove stormwater pollutants. The BioPod system offers an optional integrated high-flow bypass that eliminates the need for a separate bypass structure, reducing costs and simplifying the design. 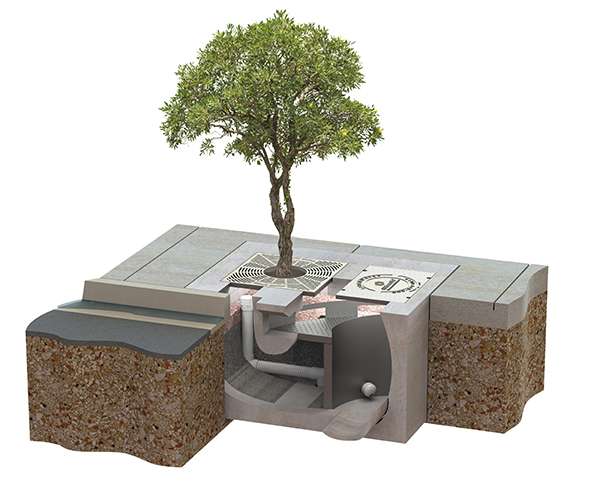 Offering flexibility of design and construction for your storm drain system, the BioPod system comes as an all in-one, single-piece unit composed of durable precast concrete for ease of installation and a long service life. The BioPod will soon be included on the Virginia Best Management Practices (BMP) Clearinghouse website: https://www.swbmp.vwrrc.vt.edu/. “Now that the BioPod has received approval, designers in Virginia will have a state of the art, engineered, high flow rate bioretention option for stormwater treatment and green infrastructure solutions,” said Joanna Ogintz, Oldcastle Infrastructure Regulatory Engineer. For more information, visit www.oldcastleinfrastructure.com. For more information visit www.crhamericas.com.